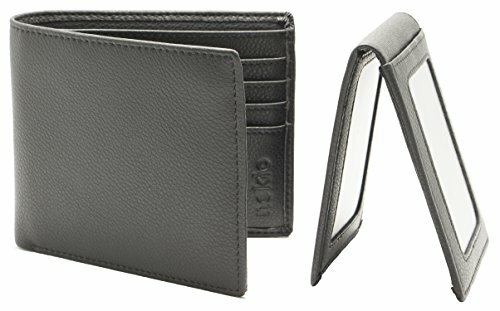 Are you trying to find a vegan RFID wallet to prevent people from stealing your money and/or identity? Well, you're in luck! We managed to find 8 options made of faux leather or other non-animal materials. 4. Men's Felix Denim and Swiss Dot RFID Wallet by Herschel Supply Co. Stylish and affordable, this ladies' wallet is designed with black textured vegan leather and an elegant gold metal bar strap. Contains four roomy pockets, a cash compartment, eight card slots and an ID window. Anti-RDIF technology blocks remote scanners. Pros: It's refined and high-quality for small money. 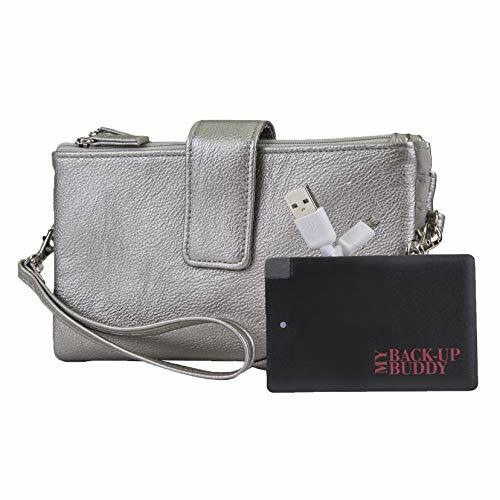 There's tons of space for your cards, cash and checkbook even though the wallet itself is rather small, which is helpful if your purse gets crowded easily. Cons: It looks like it could get a little bulky, especially when full. This dapper wallet features a woven look in brown vegan leather with tan accents. RFID-blocking to protect your data. Made with six card slots and a hidden ID pocket. Pros: The attractive design is what makes this wallet stand out. It's pretty slender, so you shouldn't have much trouble with it getting awkwardly big as you fill it with cards and cash. Cons: No coin pocket, though that would really just be a bonus. Get super organized with this RFID-blocking wallet. It's designed with multiple accordion pockets like a clutch purse with a fantastically orderly credit card and cash system. 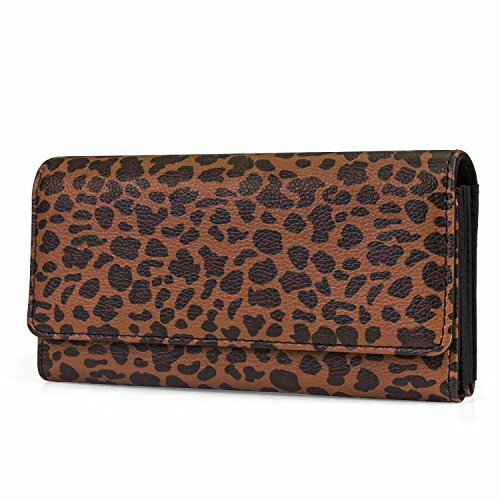 Made of stylish leopard print vegan leather. Comes with two ID windows, 13 card slots and slip and zip pockets for bills and coin change. Closes with a snap button. Pros: You can use it as a wallet to add to your everyday bag, or you can use it as a clutch and ditch the purse. With all that room and organization, you won't have to be too choosy about what you take with you. Cons: It would be nice if it came with an option wrist strap. An interesting mix of materials and patterns give this black RFID wallet a unique look with denim and swiss dots. Designed with a cash pocket and several card slots. Super slim and easy to slip into your pocket. Advertised as vegan: No, but it's 100% polyester. Pros: Small, thin wallets like this one take up little space anywhere you carry them. It won't weigh you down and works especially well for lightweight material pants. Cons: Its minimalist style limits its functionality. If you have a fair amount of cards, you may be able to get a couple in a single card slot, but probably not many more. 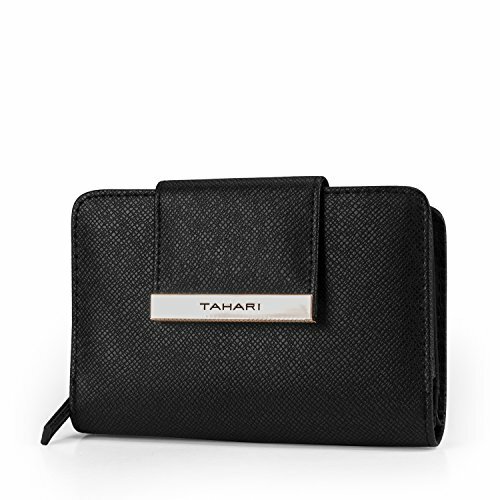 With two main zip compartments, this women's mini wallet can carry more than you might expect. 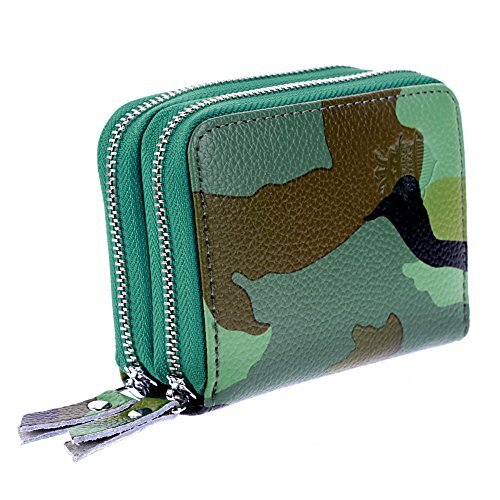 Stylish in green faux leather with camo print. 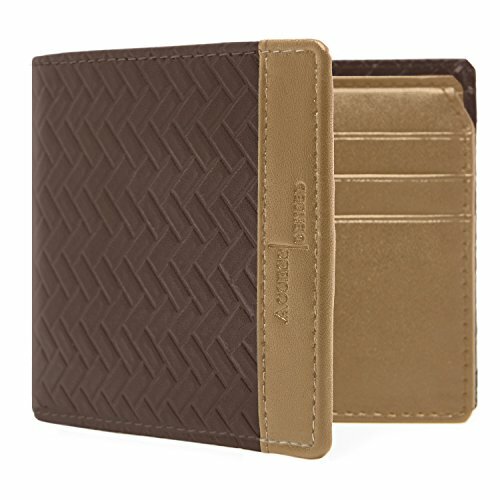 Designed with a time-saving accordion pocket in one of compartments to help you find your cards faster. Advertised as vegan: No, but it's made of faux leather. Pros: The accordion pocket is such a great idea for a small wallet. It economizes space while maximizing organization. Cons: Though it'll hold onto more than many other mini wallets, it still won't carry everything from a regular-sized wallet. Use it like an extra card and receipt holder or when you're just ducking out of the house for an errand or two. One of the neat things about this wallet is that its RFID technology blocks data theft scanners but not the kinds of scanners used in commercial and office buildings, which seems pretty smart. Constructed with six card holders and a full-length bill compartment. Made with two extra hidden pockets for cash and receipts. Pros: Between the RFID system and the extra pockets, this makes a good everyday wallet. Cons: It's not particularly slim. Need a portable phone charger? This ladies' metallic silver vegan leather wallet comes with one. RFID-blocking and equipped with a removable crossbody strap. Designed with a large zip pocket, a clear ID window, extra slip pockets and multiple card slots. Pros: An adaptable phone charger definitely comes in handy when you're out. Even without it, this wallet is well-ordered inside. Cons: Some reviewers mention that not all the charger and adapter parts necessarily come with the wallet as advertised. Lightweight but solid, Pacsafe's RFIDsafe Tec Bifold Plus features a non-RFID outer pocket for room key cards and identification cards. Constructed with six card slots and a cash area. Pros: The non-RFID pocket is a nice touch. People love the safety and functionality of Pacsafe wallets. Cons: We suppose it would get a little extra credit for a coin pouch, though that's not a typical feature of men's bifold wallets.